529 – the fund named for three little digits – is helping thousands of Americans save thousands of dollars to pay for college. However, which plan to choose and whose name in which to place the fund can make a difference on just how much savings you can accumulate. The popular savings plan got its name from the section of the tax code that governs it. Families can save large sums – in the hundreds of thousands of dollars – while earnings accumulate tax-free and remain tax-free as long as the money is used to pay for college tuition or other qualified higher educational expenses. According to the 2013 study from Sallie Mae on How America Saves for College, more families than ever before – an average of 17 percent – are using a state 529 savings plan to save for college. But surprisingly, a majority of parents, about 42%, still save for college using savings put in CDs and non-529 plans. These are the people who are missing out on tax advantages offered by 529 accounts. One of the top reasons parents have for not using 529 plans is their uncertainty about which savings plan to use. If you are a parent reading this – get started by understanding the different types of plans available. 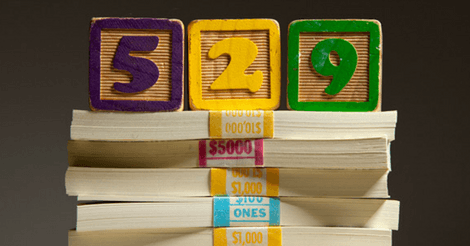 Once you have decided that 529 plans are the right investment for you – how do you pick between a Savings Plan or Prepaid Plan? For starters, you’ll need to understand the difference between the two**. Savings Plans allow you to contribute to mutual funds or similar investments. The plan usually has several investment options to choose from and your account value will fluctuate up or down depending on the performance of the investments you select. Prepaid Plans let you prepay all or part of the tuition for college because they are guaranteed to increase in value at the same rate as college tuition. “For example, if a family purchases shares worth half a year’s tuition at a state college, these shares will always be worth half a year’s tuition — even 10 years later, when tuition rates may have doubled.” explains website FinAid.org. For Chaz and Cindy Hunter, opening a prepaid plan seemed to be the best choice for them and their son Cullen. In fact, they were one of the first families to invest in Virginia’s prePAID plan. Using that prepaid plan, Cullen, now a freshman at George Mason University in Fairfax, VA, will graduate nearly debt-free. When Cullen was born in 1996, his grandparents opened up a Virginia529 fund and contributed to it for the first year. After that first year, the Hunters took over the account and deducted around $160 a month from their income, which was automatically deposited into the account. Eventually, all the savings were rolled into a Virginia prePAID account. Chaz said saving this way made some years tighter than others, but a slower, yet steady savings approach was a better savings strategy for his family. Many of Chaz’s friends, who invested their children’s college savings in the stock market, lost much of it – up to 80 percent – during the crash of 2008. Though it is wise for grandparents, such as the ones mentioned above, to start a savings fund for the child of new, sleep-deprived parents, it is prudent that the fund ultimately be in the child’s or parent’s name. Joe Hurley, creator of the popular website SavingForCollege, writes that a good percentage of 529 plans accept third party contributions to a student’s account. There are, however, gift-tax consequences of grandparent contributions to the 529 plan. Whether grandparents contribute to accounts owned by them, or to accounts owned by the parents or someone else, their contributions are a gift from them to the account beneficiary. One of many companies taking the cue of letting friends and family gift money for college is InstaGrad, a twist on social networking that enables parents to ask for online contributions to their child’s 529 plans in lieu of birthday and Christmas presents. “College debt is at an all-time high. At InstaGrad, we are trying to counter the culture of consumerism to offer a way to give the most important gift,” said founder Mauricio Idarraga, who remembers his disciplined parents buying him very few toys in sacrifice for saving for his college education. Can 529 Funds Hurt Your Financial Aid? Perhaps one of the most frequently asked questions college-bound families have when filling out their Free Application for Financial Aid (FAFSA) form is: Will the savings in my 529 plan hurt my child’s chances for receiving financial aid? How will this affect my Estimated Financial Contribution (EFC)? Savings in a 529 might decrease a financial aid package by a slight fraction. But, college admissions professionals and financial advisors agree that when colleges examine a family’s assets, they want to see that you have the ability to pay at least a portion of the tuition. 529 savings accounts are considered parental assets (whether they are in the parent or child’s name), so will be assessed at up to 5.6% and included in a family’s EFC. Brilliant and wonderfully written and insightful, informative and what a superbly-talented writer! You really captured in just this small piece, the essence and the dilemmas, realities and such, of saving for college! Really appreciate your candor, humor and warmth as you describe in the anecdotes and facts you presented. Look forward to more of your genuine and well-written work. Please add me to your email list and blog! Inspring,..great job, Stacy! Bravo!